Hate running? Yeah, us too. But you still need to get your blood pumping and push your heart rate up for a balanced fitness regimen. 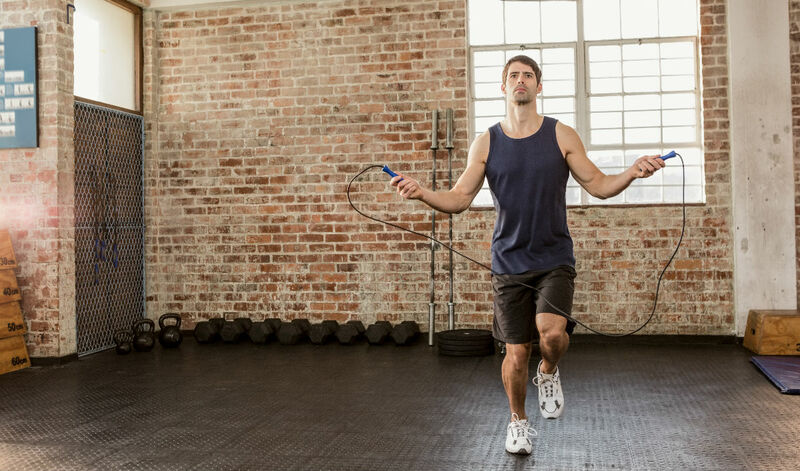 Jay Cardiello, a personal trainer for celebrities like 50 Cent and Kevin Love, keeps his clients moving with a mix of jumps, squats, and more to get a good cardio workout – minus the treadmill. All you need is some space to move, 20 minutes, and the willingness to get sweaty. Over the course of the eight-week Anywhere, Anytime bodyweight workout program, Cardiello will show you the exact circuits he uses to whip his clients into shape. Each week is focused on a different objective, and Week 5 is designed to push your cardio and core to the next level. You'll work out four days per week, performing one circuit on Mondays and Thursdays and another on Tuesdays and Fridays. Tip: Don't jump for height with this exercise. You want to cover the floor as fast as possible. Tip: Aim to stay in the air for as long as you can in a controlled manner. Tip: Swing your arms in an explosive motion in order to lift the body forward and backward as far as possible. Tip: Swing your arms to lift hip upward as high and fast as possible. Tip: Start off slow before jumping out as far as possible.